Gujarat University Exam Form 2019: The Gujarat University is going to conduct admission for various Regular and External Courses available at this university. 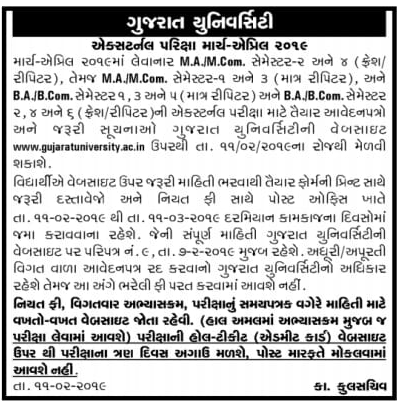 So all the eligible candidates who want to get admission in Gujarat University can apply online on or before the last date. You can check below the complete details on Gujarat University Admission 2019 through this article i.e. admission notification, important dates, online application link, application fee, and much more. The candidates who are wishing to apply for Gujarat University and its U.G. and P.G. courses need to fill the admission form of Gujarat University. The Gujarat University Admission Form available online at the official website i.e www.gujaratuniversity.ac.in. Dear Gujarat University Students, We will bring Information about the Latest Gujarat University Exam Form, Admission Notification, Admit Card, Result, Merit List published by University. You just need to require Keep Visit (ojas-gujarat.co.in) time to time for Latest Updates.